Domestic auto sales reached a new high in the first half of this year. 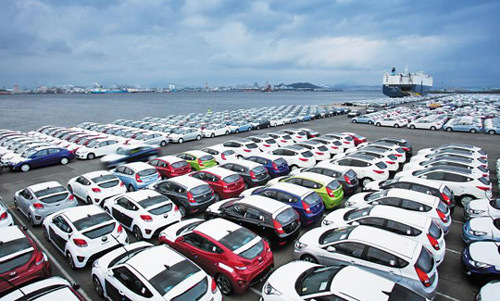 The Korea Automobile Manufacturers Association said Sunday that domestic sales totaled 812,265 cars in the first six months, up 10.9 percent on-year. This is the first time domestic sales have exceeded 800,000 in the period. Total sales including exports, however, dwindled to 4.36 million cars, a drop of 1.7 percent from the same period last year. Hyundai posted sales of 351,124 cars here and 2.04 million overseas, up 4.5 percent and down 1.8 percent, respectively. Overall, the automaker's total sales fell 0.9 percent. Kia's total sales fell 4.6 percent to 1.46 million cars, with domestic sales up 14.1 percent and overseas sales down 8.2 percent. GM Korea achieved its best-ever first-half result thanks to the launch of the new Malibu and Spark models, which boosted domestic sales by 21.6 percent on-year. Total sales declined 0.1 percent to 307,512 cars due to a drop in exports. Renault Samsung saw domestic sales rise 25.9 percent on the back of brisk sales of its new SM6 sedan, which was released in March. Ssangyong's sales rose 7.1 percent, helped by the popularity of the Tivoli small SUV.